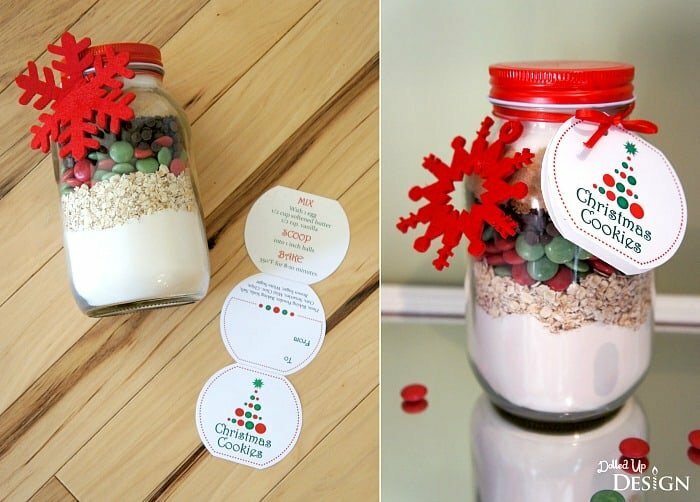 This Christmas Cookies In A Jar post is by our contributor Chantelle of Dolled Up Design…Christmas is on its way and that means coming up with gifts for the teachers, careworkers, neighbours and co-workers. 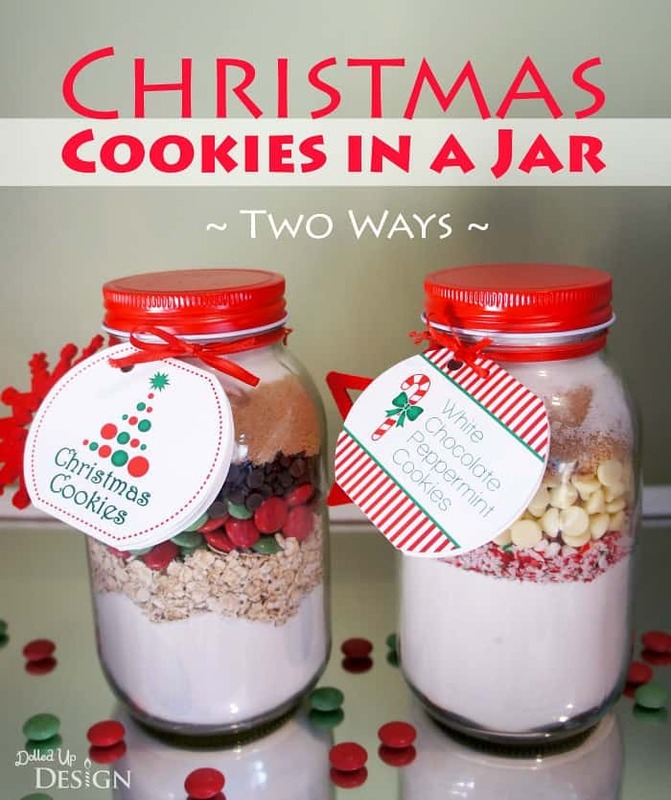 This can all add up quite quickly so today I am sharing an inexpensive DIY gift that looks great and is super easy to make – Christmas Cookies in a Jar! The inspiration for my jars first came from a commercially prepared version I saw available in a store. 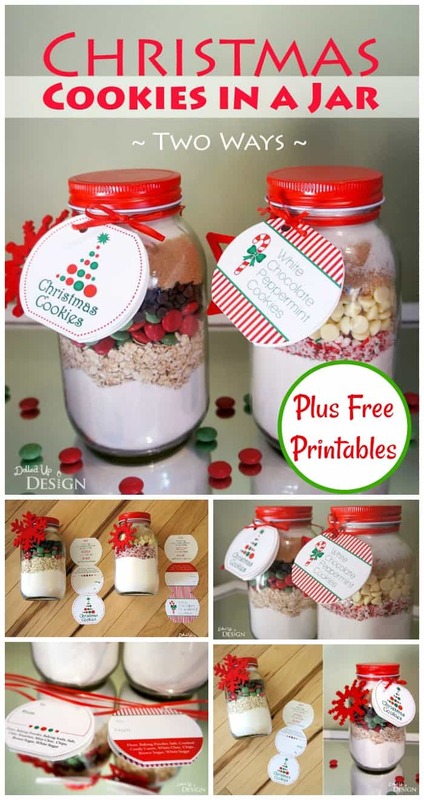 I loved the layered look of the cookie mix jar, but knew the $9.99 price tag would add up much too quickly for all the neighbors and teachers I had on my list. It looked easy enough to DIY on my own so I bought some nice 1 quart jars, found a couple great recipes and designed some cute labels/gift tags to finish off my gifts. I wanted cookies that looked and tasted festive, so I went with green and red Smarties dotted Christmas Cookie mix and a candy cane speckled White Chocolate Peppermint Cookie mix. Either would be great to bake up on Christmas Eve and leave out for Santa! Combine the flour, baking soda, baking powder and salt together in a small bowl. Pour into the jar, with the help of a funnel. I used a rolled and taped piece of paper to create a funnel. Using a spoon, carefully tap the mixture down. Pour the rolled oats over the flour mixture. Carefully pour the Smarties over the oats in an even layer. Add the mini chocolate chips to create the next layer. Spoon the brown sugar into the jar, pressing it in with a spoon to ensure it is tightly packed. Pour in the final layer of white sugar. Depending on how large or well packed your jar is, you may not be able to fit the full amount in. You can leave some out, but I don’t recommend adding any additional to fill the jar. Close tightly with the lid. Print and cut out one of my free tags, then tie with a nice ribbon around the top of the jar. *I recommend using Smarties (candy coated chocolates sold in Canada) over M&M’s to ensure your gifts are peanut free. Gently pour the crushed candy canes over the flour mixture in an even layer. Add the white chocolate chips to create the next layer. 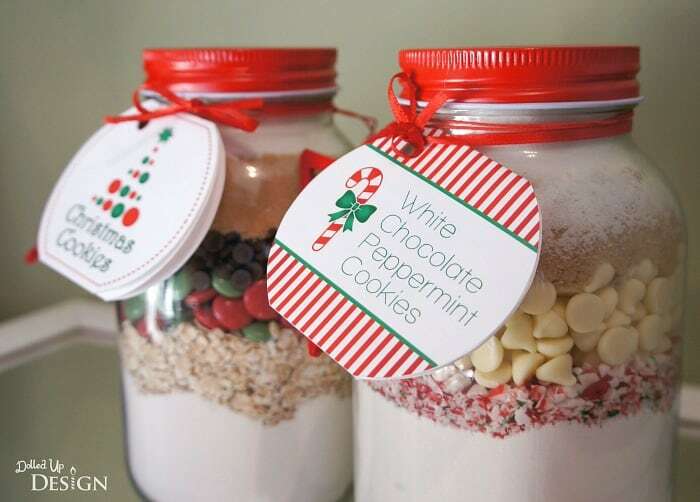 I love how pretty the layered ingredients look in the jars with the pop of red and green festive Smarties or crushed candy canes. Even for the most novice baker, the cookies are easy to bake up following the simple directions on the tag and a few basic baking ingredients most people already have on hand – butter, eggs and vanilla. These would be great to bake up for last minute entertaining or as a fun pre-Christmas activity to do with kids. 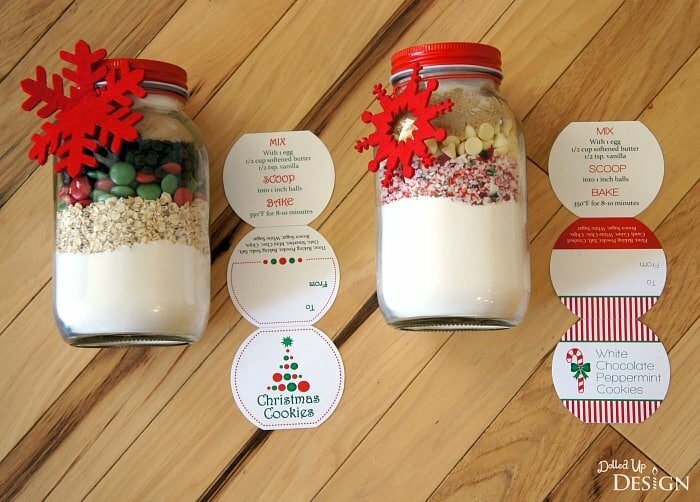 These jar mixes are easy to prepare ahead and have on hand before the full rush of the Christmas season begins. Get your children involved measuring out the ingredients and creating a fun gift you will be proud to give to all the special people who touch your life. 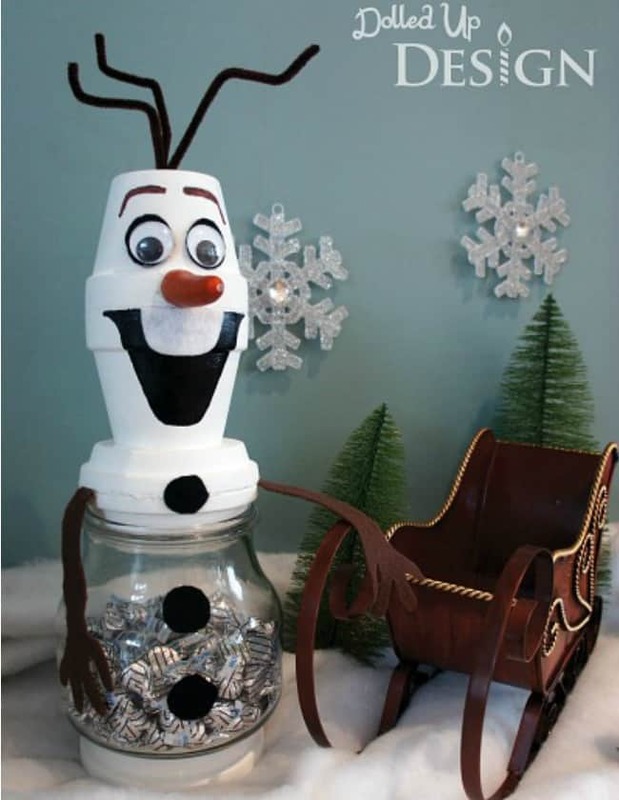 For another cute Christmas jar craft, check out this DIY Olaf jar. Perfect for “warm” chocolate hugs. We’d like to send a big THANK YOU to Chantelle for sharing these creative Christmas ideas with us! Her parties & crafts are always easy to recreate and kids love them! Be sure to follow her on Facebook to stay updated on all her fabulous ideas. I’m thinking of using your white chocolate peppermint cookie mix for gifts this year. I made the mix and wanted to make the finished product to see how they taste. I added the egg, vanilla, and softened butter. Alas it is still WAY too crumbling to make into cookies. Is there another liquid I’m supposed to add to bring it all together? Thanks! I was wondering the same thing as Heather. Most cookie recipes with that much flour use 1 cup of butter and 2 eggs. Would like clarification before handing out gifts. Hi Alison! Yes, you are correct. 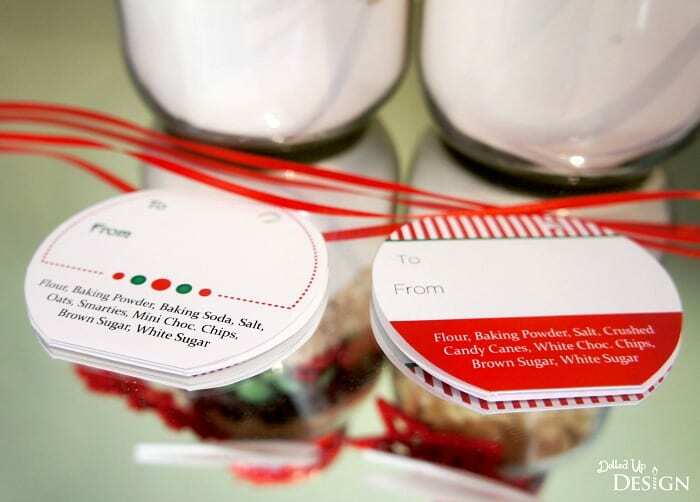 The PDF file (instruction tags) for the White Peppermint Cookies has been updated. Thank you! Hi Heather! Sorry about that – you are correct that there was an error there. The PDF file (instruction tags) for the White Peppermint Cookies has been updated. Thank you for bringing it to our attention! Hi the other cookies with the red and green smarties hasn’t been updated. Still only half the amount of butter and egg? Hello, I love this idea, trying to print the tags and not able to pull them up. Hi there, Is it possible to get an editable version of the gift tags. I live in New Zealand and need to change ºF to ºC and the 1 inch balls to 1 tablespoon balls? Hi Gemma! Sorry, we don’t have this in an editable file.